I love lemon bars, but I don't like baking them for some reason. However, having recently bought a huge bag of lemons from our local warehouse club, I decided to make Lemon Bars. Although the last time I made lemon bars I thought they were really good, I used The Pioneer Woman's recipe this time. The end result was indeed delicious, yet a lot more tart than the recipe I last used since this recipe requires more lemon juice. 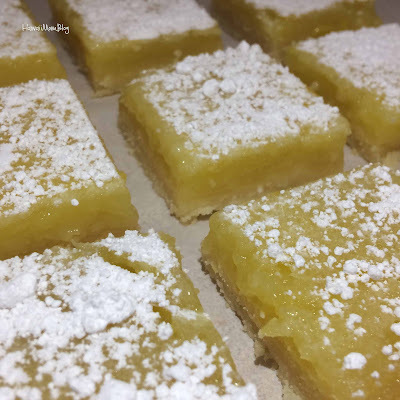 So if you like tart, you'll love these lemon bars! Mix together the flour, sugar, and salt. Using a pastry cutter, mix in the butter. Press mixture into a prepared 9x13 pan and bake for approximately 20 minutes. Mix together the sugar and flour. Stir in the eggs, lemon zest, and lemon juice. Pour over baked crust and bake for approximately 20 minutes. Refrigerate for a few hours of before topping with powdered sugar and cutting into squares.